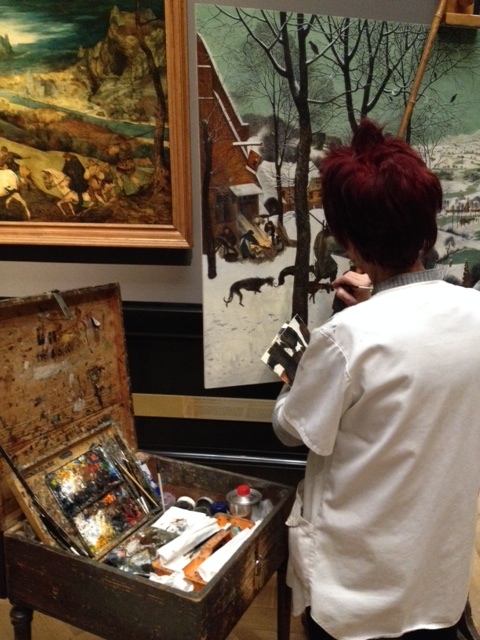 Some regular visitors to the Vienna Kunsthistorisches Museum head straight to a particular painting. Austria subsidizes yearly passes for museum visitors, so many–some say a majority- of Viennese would not think of being without a yearly ticket and popping in to visit favorite works of art on their daily rounds. 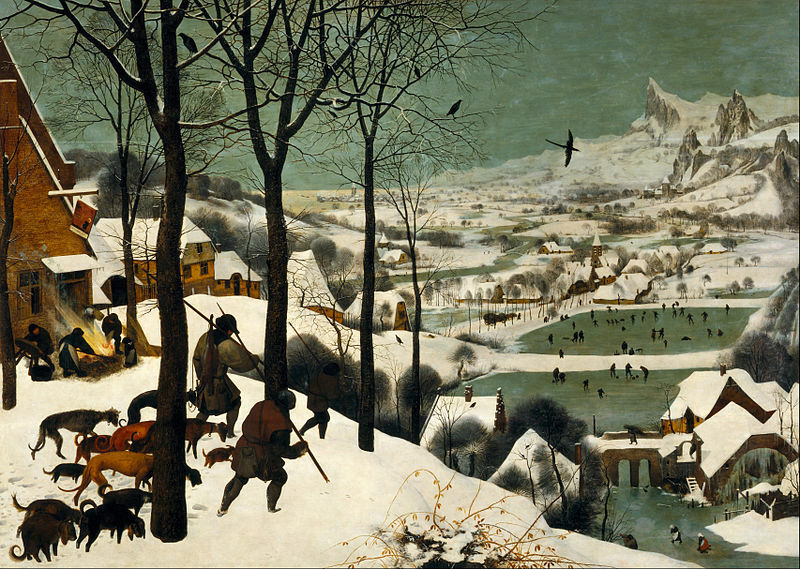 A particular favorite is “Hunters in the Snow,” painted in 1565 by Pieter Breugel the Elder. Some people consider it the most beautiful and intriguing painting in the world. It doesn’t draw the crowds of the Mona Lisa in the Louvre, but there are always a few admirers standing before this painting, transfixed. Last time I visited the Kunsthistorisches, I lingered in the glorious roomful of Breugels. A woman was absorbed in painting a perfect copy “Hunters in the Snow”. I envied her: she was spending untold hours lost in the vision of a great artist who captured a winter day almost 500 years ago. Breugel was a Flemish artist, but this is not a landscape from the Low Countries. He was known to have traveled to Italy, and he very likely passed through the Austrian Alps on his way. This is definitely an alpine landscape, which would have seemed exotic and particularly beautiful to the folks back home. I spent awhile looking over this artist’s shoulder. What better way to spend a winter afternoon than in the company of Pieter Breugel the Elder, gazing at a landscape that he brought home as a perfect memory of his travels? 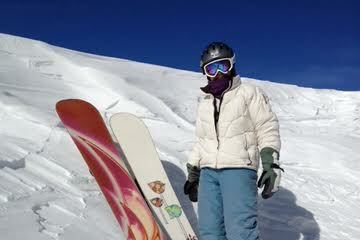 I am home from my own travels, back in the mountains of Colorado, having my own perfect winter days playing in the 16 feet of snow we have received so far this winter. 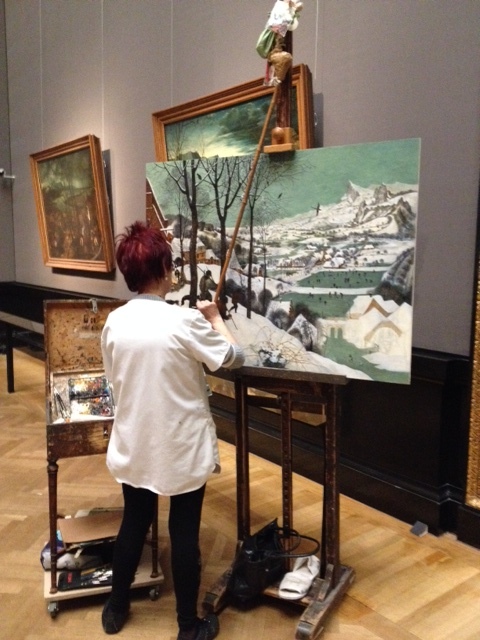 But I can imagine a different kind of winter’s day, spent sharing brushstrokes with a great artist. What painting would I choose? What kind of permission would I need? Could I fit my paints and brushes into my carryon? It’s another travel dream. This entry was posted in Art, Austria, Vienna and tagged "Hunters in the Snow", Pieter Breugel the Elder, Vienna Kunsthistorisches on January 20, 2014 by Claudia Suzan Carley.